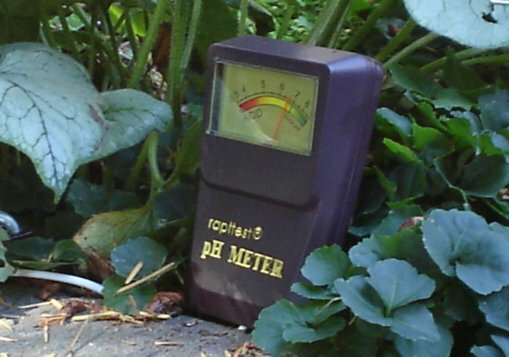 Understanding your soil pH levels can dramatically affect the health of your landscape. Soils contain nutrients which are important to plants, similar to the way foods carry important nutrients for our bodies. Without these nutrients plants suffer, and may even die of malnutrition. In particular, nutrients such as Nitrogen (N), Potassium (K), and Phosphorus (P) are of prime importance to the health of your plants. Soils also contain secondary nutrient elements such as calcium, sulphur, and magnesium, as well as trace elements, such as boron, chlorine, manganese, iron, and copper. Each of these nutritional elements plays a role in ensuring that a plant has energy to grow and to obtain sugars through the process of photosynthesis. Plants which do not receive adequate nutrition may show symptoms such as stunted growth, yellowing or malformed leaves, or even death. Soil pH can highly affect the availability of nutrients to your plants. Extreme levels of pH can lead to toxic amounts of trace elements in your soil, and eventually to the death of your plants. Trace elements such as copper, boron, and molybdenum become much less available to plants at low soil pH levels. So pH matters to a garden designer who wants to have a healthy landscape. Understanding how soil pH affects nutrients can help guarantee that your garden receives all it needs to be healthy. To adequately plan appropriate plantings and achieve a long lasting design, soil pH levels must be a part of the residential landscape design assessment steps. So what is this pH that is always talked about in gardening circles? I am convinced that a large percentage of the folks who refer to it have no understanding of what it really means. So I’m taking a moment here to talk about what pH actually is. The abbreviation pH actually is shorthand for “potential for Hydrogen”. It is a scientific measure of how much hydrogen concentration a particular substance may have. The scale used to measure potential hydrogen content is referred to as the pH scale. The pH scale has become a standard measurement of acidity. It was developed in 1909 by a man named Soren Sorenson, who was a Danish chemist. The pH scale developed by this chemist has been applied to the measure acidity of everything from cosmetics to drugs since 1909. Substances, based upon this scale, are referred to as being alkaline, neutral, or acidic. The short video following is a fun look at what the scale of pH translates to in our world. You will see the standard pH scale used, which ranges from 1 through 14, with 14 being the most acidic and 1 being the most alkaline. When discussing soil then, we refer to soils the same way, as alkaline, neutral, or acidic soils. Acidic soils are those soils which have pH levels of less than 6.5 on the pH scale, and alkaline soils are those that are on the other end of the pH scale, from 7.0 to 14.0. Neutral soils lie in the range from 6.5 to 7.0, which most plants prefer. How do you find out what your soil pH is? The process is very simple and is easily done. It works by creating a solution that can be measured employing a universal indicator solution. The universal indicator is a mix that is composed of several chemical compounds which react to acids. By adding a small amount of the universal indicator to a solution of water and your soil, you can determine soil acidity. Adding this compound to a soil and water solution allows you to visually identify where on the scale your soil lies. Watch the following video if you are interested in a short representation of how this works. In this video, increasing amounts of acid are added to a universal indicator solution. Note as the acidity of the solution changes, the color of the water solution changes, allowing us to “see” the relative acidity of the soil. You can see how the chemical compounds used in the universal indicator can measure the acid in a solution. So you are not a scientist? Don’t have a bunch of chemical solutions lying around the house for ready use? Not to worry! There several ways to go about testing your soil for its pH level, most of them very inexpensive and all of them quite simple to employ. Soil tests can easily be obtained from locally available agricultural extension offices or from commercial soil testing services. For these options, you will usually need to gather soil samples yourself and mail them to the office. They will do a full workup of your soil, and provide you with not only your pH levels, but with additional information such as nutrient content. Inexpensive soil testing methods are available commercially through the internet, from your community soil extension offices, or from neighborhood garden centers. The most commonly used commercially available methods of testing soil for pH concentration at home are the soil meter and soil test kits. Both are available at garden centers and department stores carrying garden products. These soil testing options are reliable enough for the home gardener to get a sense of the relative acidity of their soils. It is important to recognize that for gardening activities, getting an exact scientific reading within a small tolerance is just not important. What IS important is an understanding of what soil base you have, so that you can work with that soil base to choose plants that will thrive, and to know what sort of soil conditions you will be working with. Soils can be adjusted for pH concentration to a certain extent, but adjusting soil pH on a large scale is expensive, and is always a temporary solution. Consistent applications of soil conditioners are required to keep soil pH at whatever level is ”perfect” for your plant choices, and it is impractical to continually apply large scale soil adjusters over time. So it is by far best to work with the soils you have, and save your soil amending efforts for smaller garden areas as you deem fit.